This is definitely a job for Nok-Out—an odor-eliminating product that is non-toxic, fragrance-free and absolutely works wonders providing it is used specifically. Gasoline presents a particular challenge for Nok-Out because while Nok-Out requires direct contact with the odor source, gasoline and water don’t mix and can barely come into direct contact with each other. Therefore it is a bit difficult to achieve the direct contact that is required for Nok-Out to do its job. However, there is something in Nok-Out called a “surfactant” (you could think of it as a kind of soap) that allows direct contact between water and oil (gasoline is petroleum oil) to occur so Nok-Out can work against this powerful odor. I would suggest to thoroughly t air out the vehicle first. 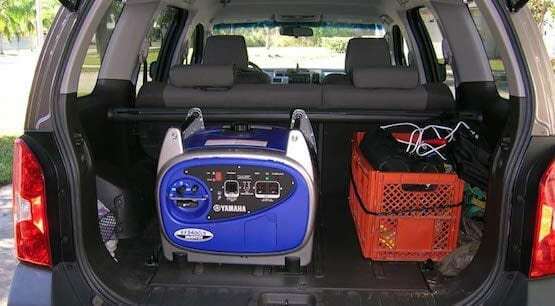 Then get into the back where the generator did the deed. Get your nose down into the area and try to pinpoint exactly where the odor is coming from. Mark those areas with chalk (or some other way to note specific location). Keep in mind that Nok-Out needs to come into direct contact with ALL the smelly stuff—all it takes is one missed spot to allow the odor to remain. There may be spots one wouldn’t think of that got a douse of that gasoline. Wait for it to dry fully before giving it the smell test. Open all of the windows and let fresh air fill the car. Repeat if needed. Be sure to check by pulling back the floor cover (carpet or rubber) that was under the generator. It may be that there is a space under this floor that got doused as well. Maybe there’s a spare tire or something else under there that’s hiding a bit of raw gas. Think of this process as getting rid of a little bit more every time you do it. Each time, it’s as if you have scraped away another thin layer and with persistence, you will eventually have gotten all of it. Keep in mind that gasoline is highly volatile and some of the loose molecules that evaporated into the air may have been re-absorbed by other materials in the car as well. (Think: Headliner and seat cushions and so on). It may also be a good idea to use a household vaporizer to get to these out-of-the-contaminated-zone areas: Pour 4 to 6 oz. Nok-Out full strength into the reservoir of the vaporizer and turn it on. Allow the car to remain closed up overnight with the vaporizer running, then open the windows and allow it to air out thoroughly in the morning. Eliminating gasoline odor really is a tough assignment, even for Nok-Out. But don’t give up. I’m confident that if you are persistent you will eventually get it all. Need more help? You can call Ted, Nok-Out HQ, 1-866-551-1927.